This year was the biggest meet to date, both in the number of models that went through my hands and in the number of attendees. I believe around 75 people attended this year’s meet. 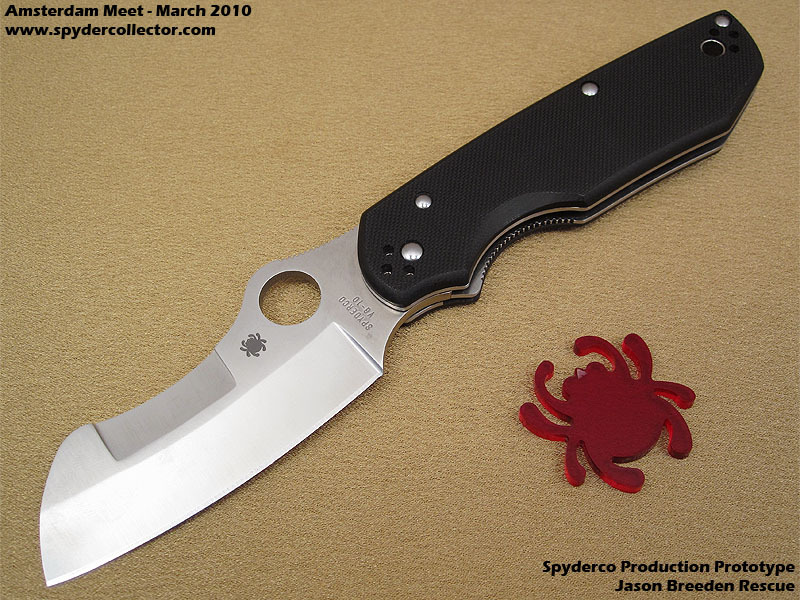 It’s always great to see how easy all these ‘strangers’ connect to each other through their common interest in Spyderco knives. This year, I added a small acrylic bug in some pictures to give you a better idea of the relative size of the prototypes. This knife will have a VG-10 blade and it will be made in Japan. 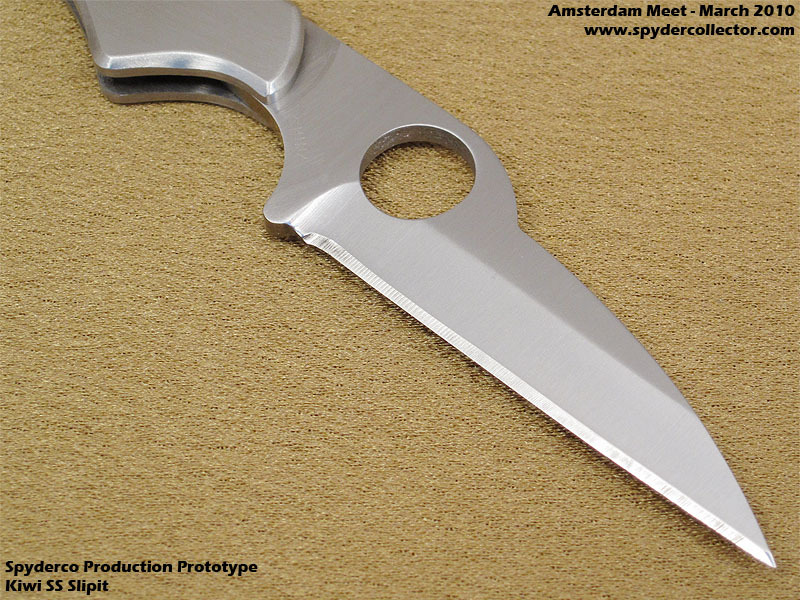 The G10 for the handle btw, will be shipped to Japan so the knife can be assembled there. 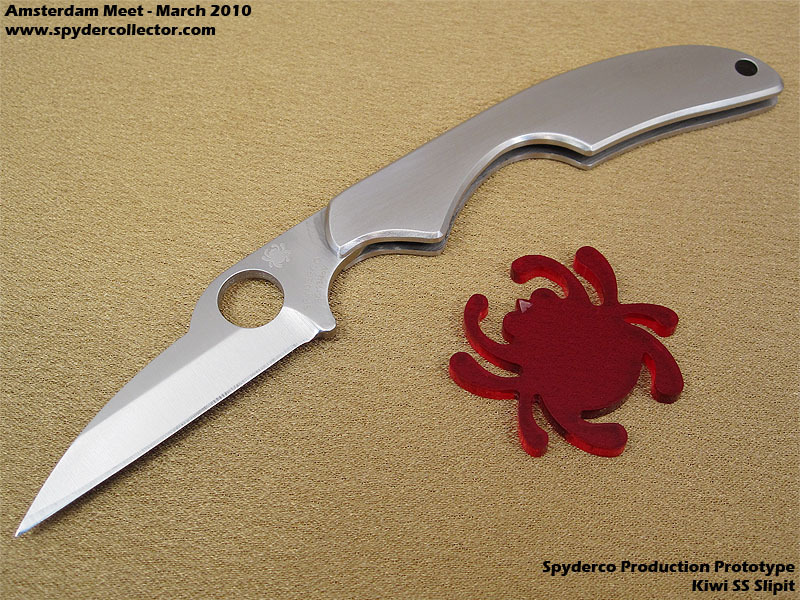 Incidentally, when the reverse happens –when parts are shipped to Golden for assembly- Spyderco generally won’t mark the knife as ‘made in USA’. This Jason Breeden model has IMO a similar heft and feel as the Captain. It may seem a little blocky, but it feels pretty good in the hand and it’s lighter than it looks from these pics. Apparently the Kiwi was originally intended to be a slipit, but it just couldn’t be turned into a slipit in the original size. 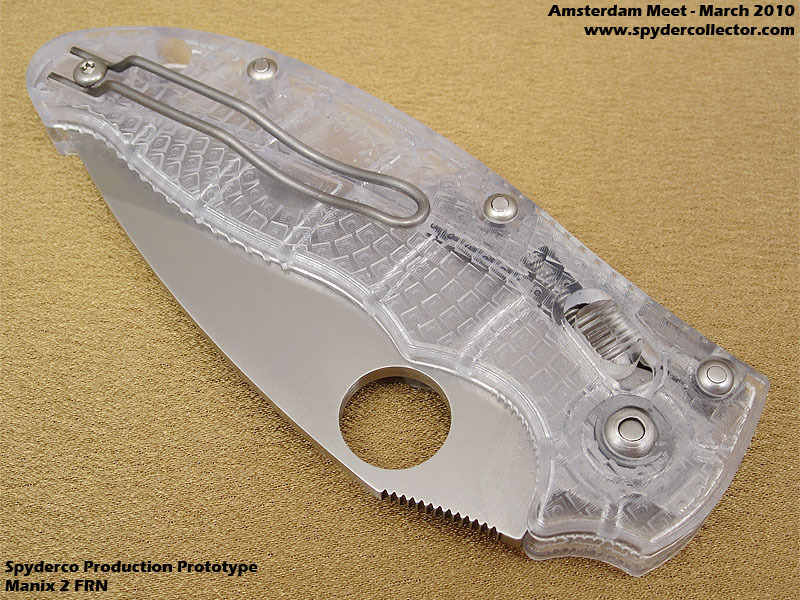 This version is a little bigger than the original kiwi, leaning towards a Delica size, and it’s a slipit. The slipit action was a bit rough on this prototype. 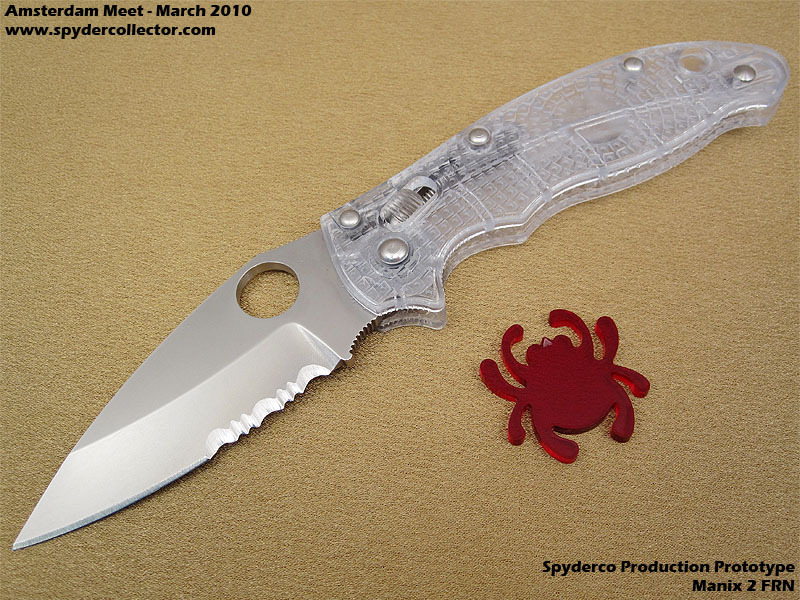 I suspect it will become smoother when this Kiwi becomes a production knife, but Spyderco is looking to a ‘rougher’ opening action for this slipit so that it complies with ‘ flick-laws’ of some countries. As a side note, in some countries the G10 Delica was not qualified as a ‘ flick-knife’ because customs could never flick it open (when held by the handle). There is simply too little steel in the blade –and weight- to swing the blade out with any force. I have to stop here for today, but I decided to stop with a nice surprise (at least to me). 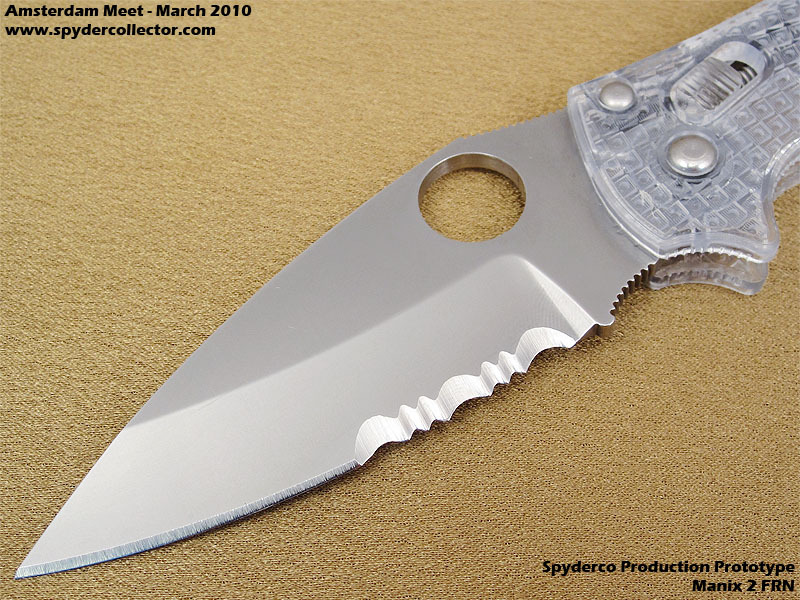 This is a Manix 2 with a clear FRN Handle. 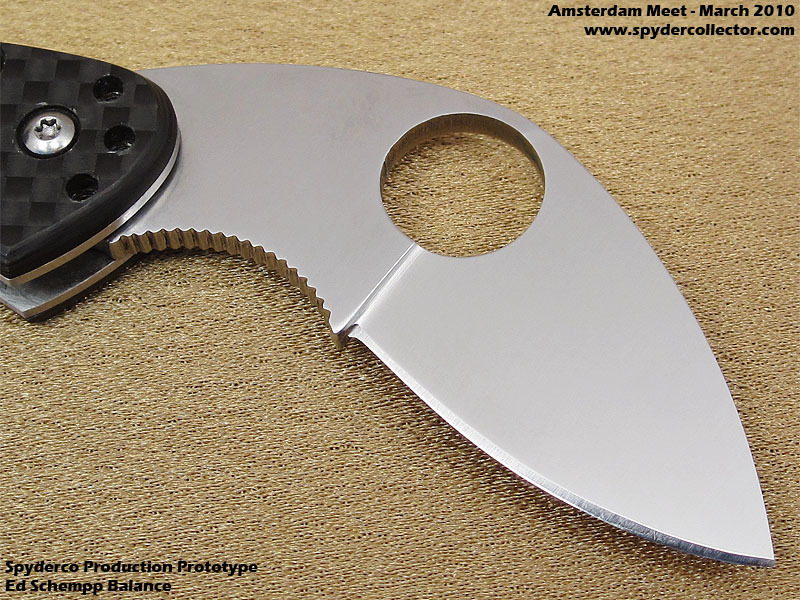 The Manix has gone through quite an evolution, and it’s still evolving. The original goal was to create a ‘ small’ tough and do-all folder. The original Mini Manix was too heavy for most users. 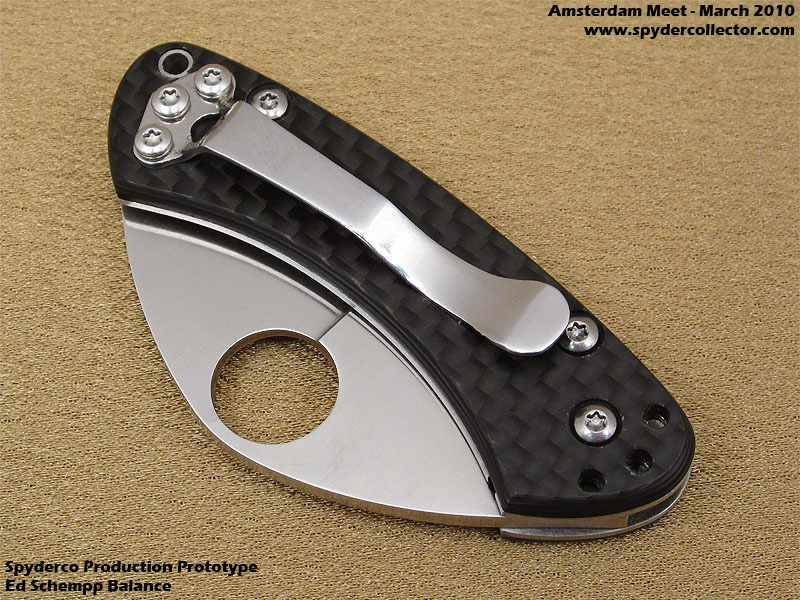 The Manix 2 has incorporated some major refinements: less weight, bigger lanyard hole, the lock (and opening action). 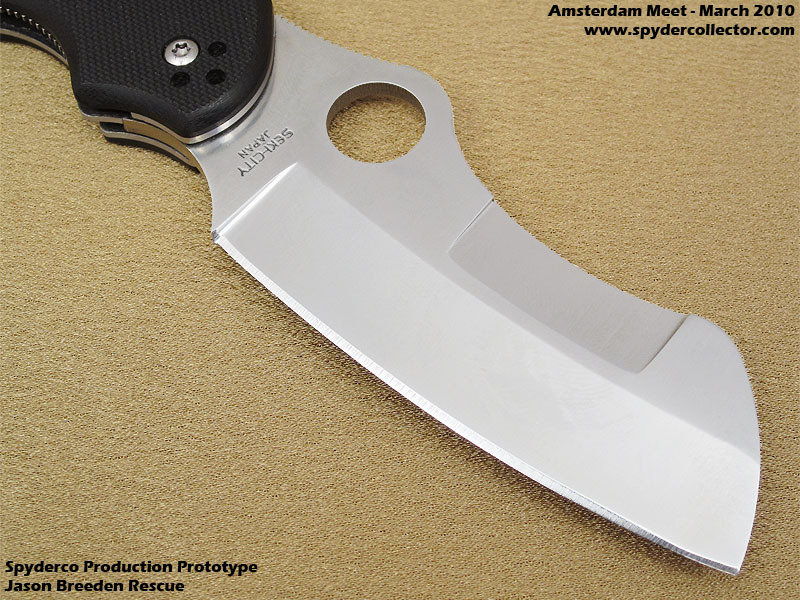 This FRN version is a lightweight alternative to the Manix 2. This prototype was a tiny bit ‘squeaky’ in the handle, when it was tightly gripped, but I’m sure that will be solved in the production version. 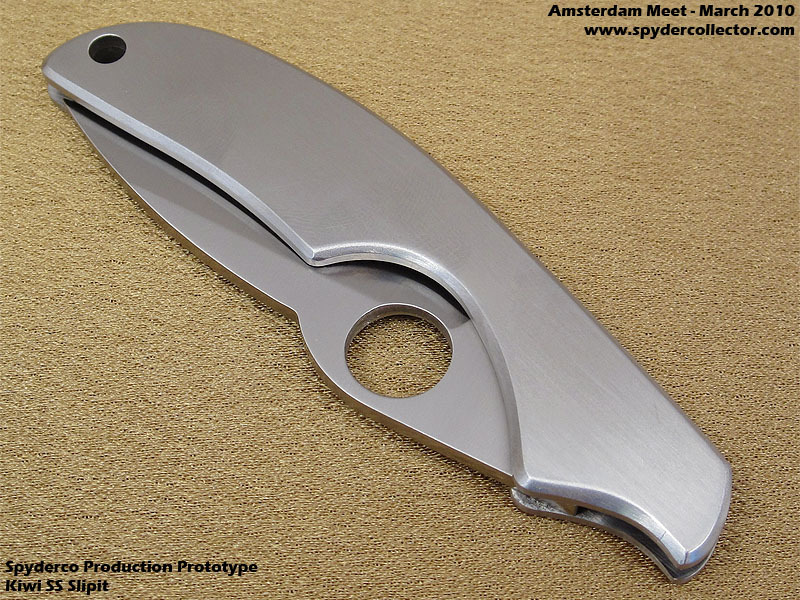 This handle turns the tank-like regular Manix 2 into a lightweight. It feels very light in the hand with all the heft going to the blade. The see-through is a cool feature. It turns a ‘tactical folder’ into a techno-gizmo and conversation piece. The ergos were very nice. FRN is always softer to the touch than G10 slabs and steel liners, and this FRN handle was no exception to the rule. 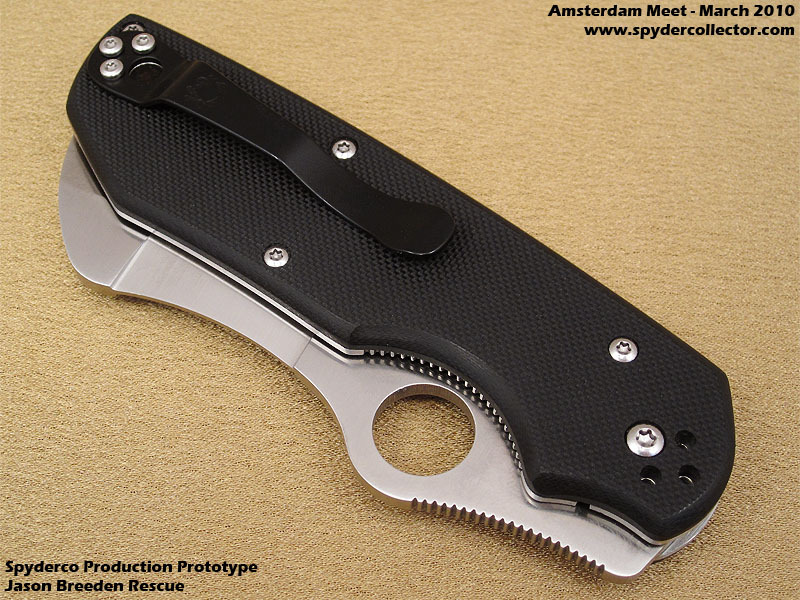 According to Eric this FRN Manix 2 won’t be as strong as the regular model, but not by much. This entry was posted on Sunday, March 7th, 2010 at 10:00 pm and is filed under News, Prototypes. You can follow any responses to this entry through the RSS 2.0 feed. You can leave a response, or trackback from your own site. I love the Kiwi & Balance models! You have a PM incoming my toxic brother! I appreciate your enthusiasm, but please don’t re-edit the pictures. 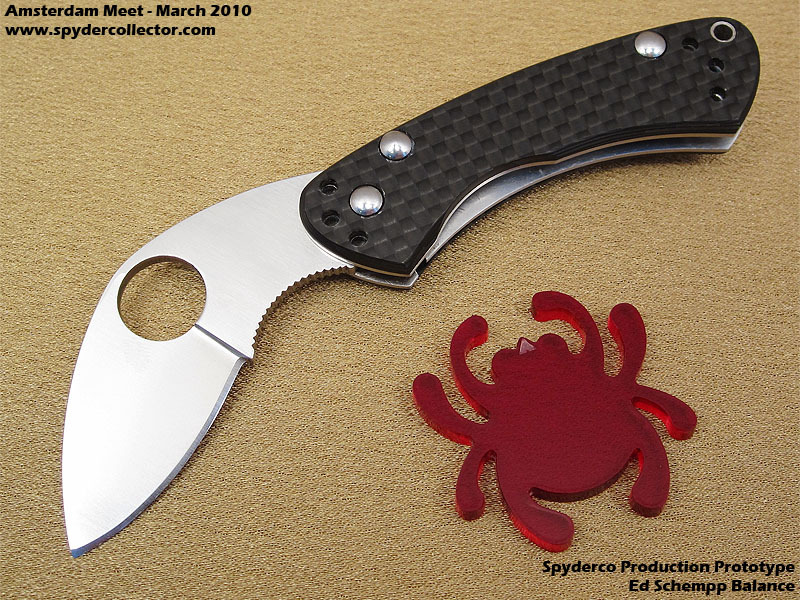 You are leaving out the information that Spyderco wants in there; the fact that every model you see is a prototype which means that small changes can still take place in the production process. How long is the Rescue’s blade? Hey can I reference some of the content found in this entry if I reference you with a link back to your site? It depends on the type of content and in what environment it’s posted. I don’t mind a fellow collector/enthusiast using some content with a reference to http://www.spydercollector.com as the original publisher, but I don’t appreciate a webshop using my content for commercial purposes without any type of compensation. What would you like to repost and where?